Hello, happy Friday! 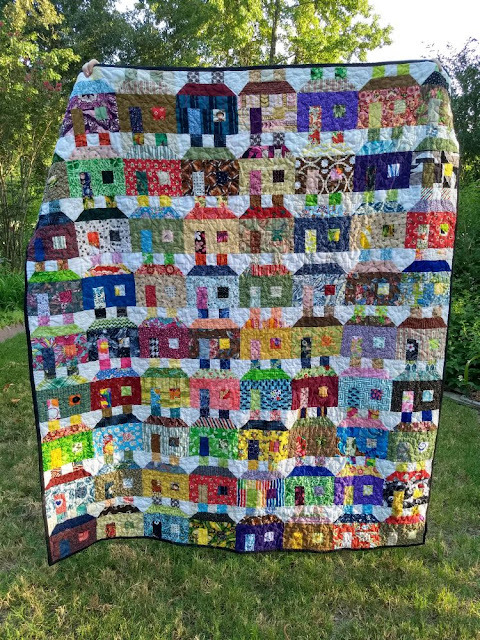 Things have been busy around here, sewing, work, and a special little surprise (see the end of the post). Mina sent in four more of these cool village tops for Covered in Love and I quilted them. You can see the first one she sent here. I found some more fun backing fabrics to match the brightly colored fronts. Thanks to many donations I have a nice selection of backing fabric to choose from. Testing out my new indoor rainy-day photo system today and I think it works pretty well. I need to get a few more lights and figure out how to make the quilt hang straighter. I had a patient in her 90s the other day with a little mild dementia. We ended up realizing she grew up in the same tiny town where I now live and we were able to talk about all kinds of people and places that she remembered. It was fun to hear how different things were back then, but also how many things are the same. It really is a small world, after all. I promised you a "little" surprise. 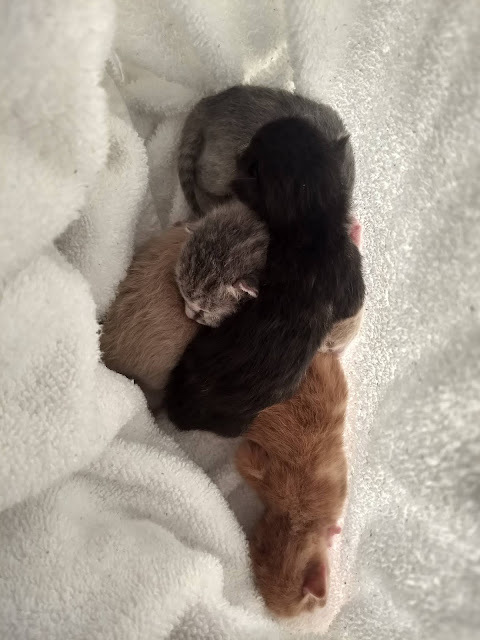 Well, these four babies joined me on Saturday the 22nd. About 2-3 days old and lost by their mom during a Thunderstorm. I've been staying home as much as possible since they'll require around the clock care for the first 3 weeks, so my sewing time has benefited, although my sleep has not! My current cat, Tugger, who is 9, was abandoned at a week with his siblings. He had a gash in his leg, so was fostered out until healed. I adopted him at 4 months. He is always a needy cat, but a bully to any other cats, so I only have him. I would love to have a gray tiger to replace my beloved Cinders that I lost years ago to diabetes. So glad you did not let the little ones perish. Your village quilts are colorful and cute, especially with the fussy cut surprises. And what a special conversation you had with the 90-year-old patient. How sweet that she remembered details about the town. The four little kittens are going to take up a lot of your time - enjoy spending time with those adorable sweeties. 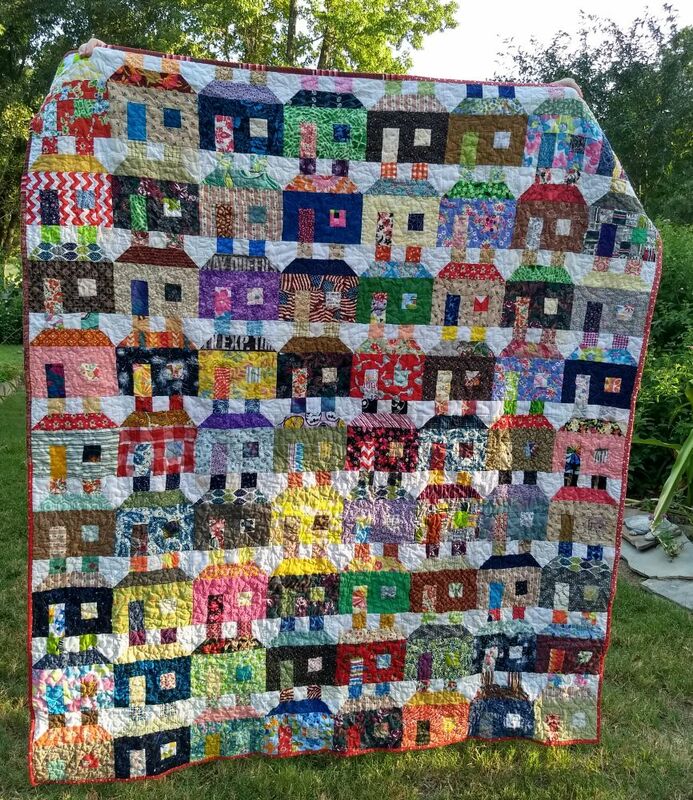 These house quilts are an amazing donation! Good luck with your teeny fur babies! What sweet little kitties! I am so glad you rescued them and are taking good care of them. Not everyone is willing to give them the special care they need. Those house quilts are beautiful and the backings are perfect. What good matches! Oh, I love these house quilts! So fun and cozy. Mina is a genius with scrappy color combos! And the babies are soooo sweet. I've been enjoying your photos on IG of them, and the indoor shots looks really good. The colors are right, which is the hardest thing about indoor lighting. It may be a small world but it is so tight-knot and therein lies its beauty. 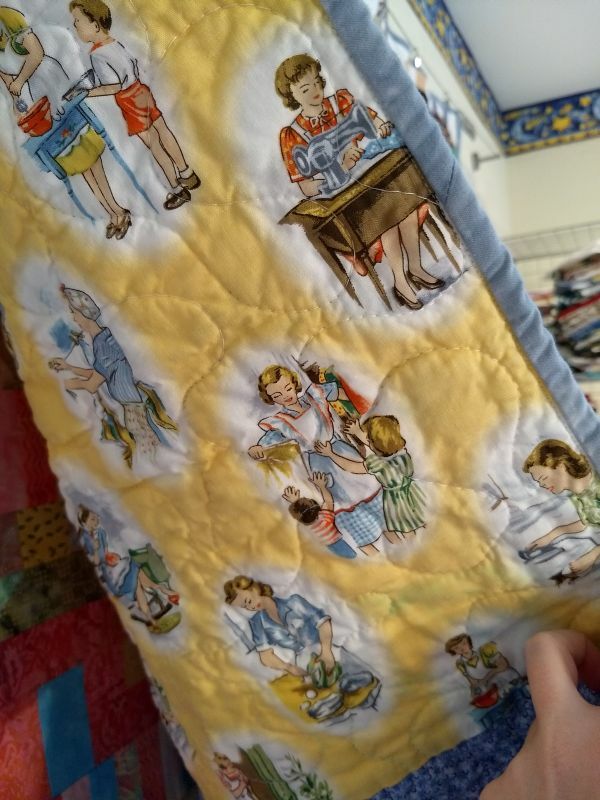 The vintage backing is a perfect touch for a quilt that reminds of simpler times. 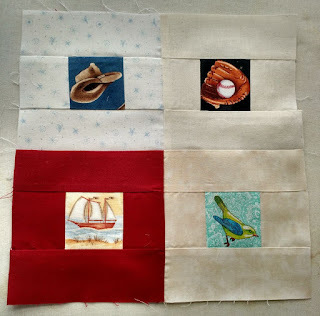 Your backing fabrics are really fun. Your donation mission is very admirable. You have such a kind heart and your little kitties are lucky to have you. All it took was one quick look at your label on the linky party at Busy Hands and I was "hooked" by the beauty of the house quilt but also by the earworm that's now singing in my head and probably will be with me all day!! Your kittens are SO tiny! What a job, and what a heart you have for helping. 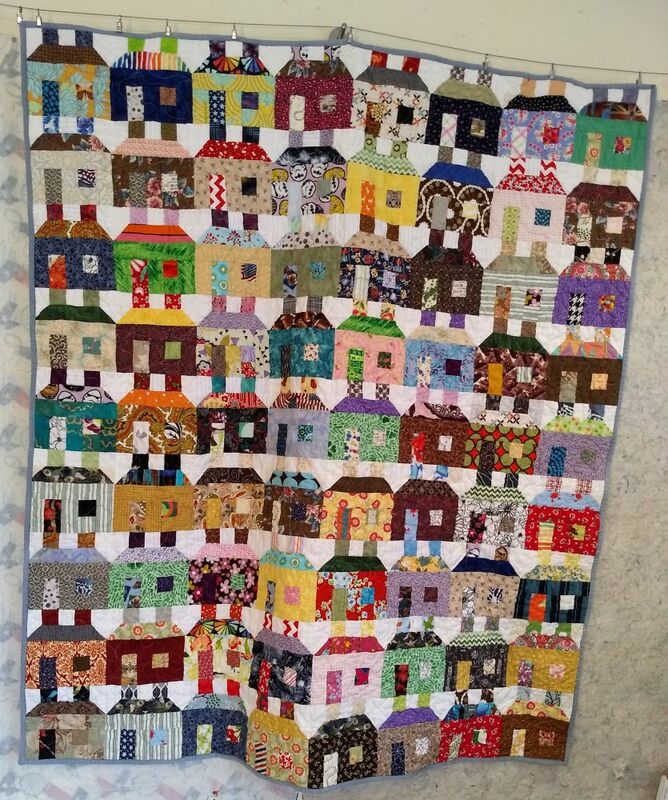 I think the house quilts and the backings I could see are just fabulous. What a wonderful thing you are doing, and then you take the time to talk to the people you visit! You are doing a great job on "being mum". Good team work on the quilts. The house quilts are wonderful! The backings are a wonderful match. The kitties look so sweet sleeping in a pile. Mina is awesome and I love the little surprises in the windows. 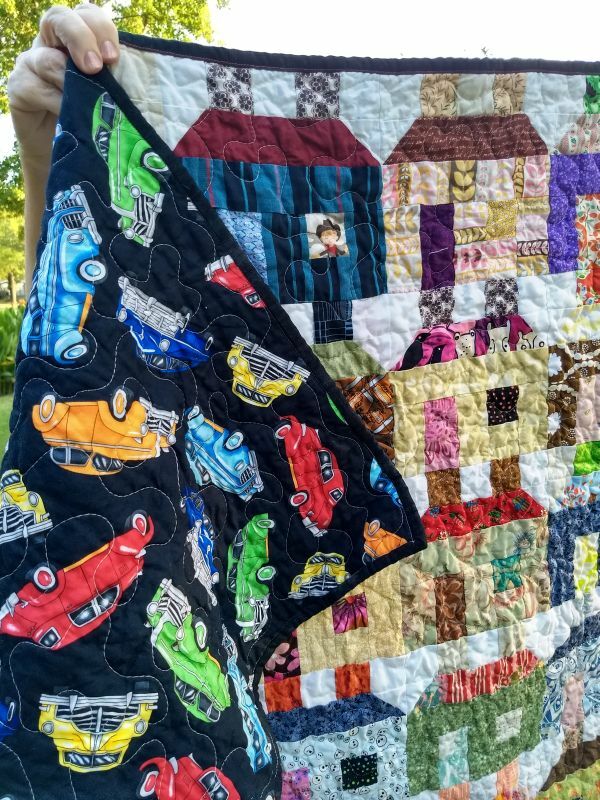 I have always had an affinity for house quilts and these are awesome. The backing fabrics just make the perfect finish. Perhaps we will do one sometime for a CIL monthly block. 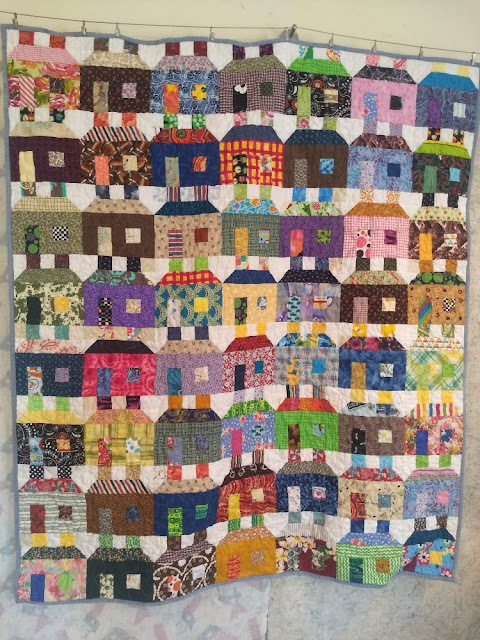 The house quilts are so fun & will be put to good use at CiL. Thanks to Mina for the contribution. I'm sure your conversation with your patient was a very rewarding one for the both of you. Your four new little fur babies fell into the right hands when you found them. Thanks for your loving, tender heart! Bless your heart for caring for those kittens! Lois, I don't post my address online but you can email coveredinlovetx@Gmail.com or leave your email here and I will send it to you.